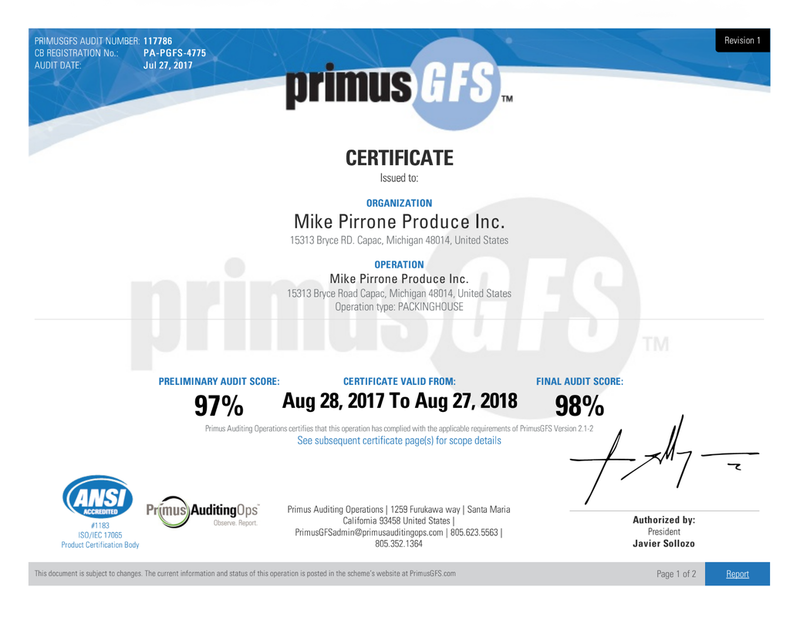 Food safety is essential to Mike Pirrone Produce and Berville Farms LLC. To guarantee our food’s safety, we are able to track land history and all aspects of the planting, growing, packing, and shipping operations. Our food safety program ensures that policies are up-to- date and enforced. Mike Pirrone Produce and Berville Farms LLC are proud to be an area leader in food safety because of our established and reputable program. We have had a complete food safety program refinement over the years to ensure the best practices for harvesting, handling, washing, and packing produce. In 2017, we updated our systems and invested in new technology software that ensures accountability and traceability throughout. Good Agriculture Practices (GAP) and Good Manufacturing Practices (GMP) protocols have been established to ensure consistent production. Mike Pirrone Produce and Berville Farms LLC are audited annually by PrimusGFS. Additionally, government agencies and other third party auditors perform routine audits. Furthermore, we perform our own internal reviews. In regards to our organic products, we are certified by the National Organic Program. Copyright 2018 Mike Pirrone Produce, Inc. All Rights Reserved.